A new paper is being spun by warmists as debunking the recent record highs in Antarctic sea ice. According to the authors, a change in satellite sensors in December 1991 led to a "significant error" in either the data prior to 12/91 or the data after 12/91, but they don't know which one. It's also curious that this "significant error" occurred 23 years ago, but was not found until Antarctic sea ice hit all-time record highs, and that they don't know whether the data since 12/91 is erroneous or not. Color me skeptical, but the alleged step-change in data in 12/91 shown at the red arrow below is not apparent from the data, which shows little to no change in trend from 1979 to 2001. The increasing trend began around 2002, around the same time as global cooling. 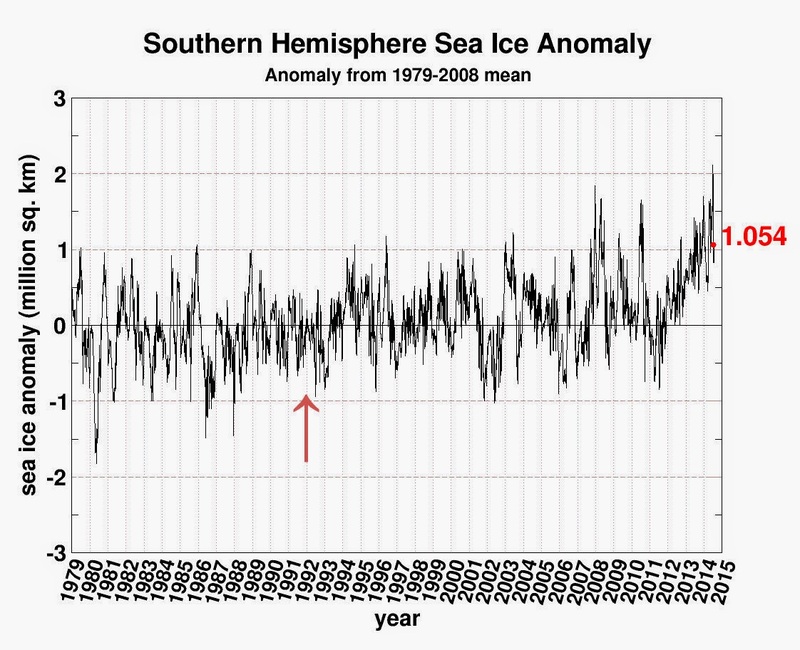 Regardless of attempts to soften the huge blow to warmism, the sensor and processing algorithm have not changed since 12/91 and thus the recent increasing trend in Antarctic sea ice since ~2002 is real. Summary: Antarctic sea ice may not be expanding as fast as previously thought, new research suggests. A team of scientists say much of the increase measured for Southern Hemisphere sea ice could be due to a processing error in the satellite data. "This implies that the Antarctic sea ice trends reported in the 2007 and 2013 assessment reports from the Intergovernmental Panel on Climate Change can't both be correct: our findings show that the data used in one of the reports contains a significant error. But we have not yet been able to identify which one contains the error," says the study's lead-author. New research suggests that Antarctic sea ice may not be expanding as fast as previously thought. A team of scientists say much of the increase measured for Southern Hemisphere sea ice could be due to a processing error in the satellite data. The findings are published today inThe Cryosphere, a journal of the European Geosciences Union (EGU). Arctic sea ice is retreating at a dramatic rate. In contrast, satellite observations suggest that sea ice cover in the Antarctic is expanding -- albeit at a moderate rate -- and that sea ice extent has reached record highs in recent years. What's causing Southern Hemisphere sea ice cover to increase in a warming world has puzzled scientists since the trend was first spotted. Now, a team of researchers has suggested that much of the measured expansion may be due to an error, not previously documented, in the way satellite data was processed. Scientists have used satellite data to measure sea ice cover for 35 years. But the data doesn't come from a single instrument, orbiting on a single satellite throughout this period. Instead, researchers splice together observations from different instruments flown on a number of different satellites. They then use an algorithm -- the most prevalent being the Bootstrap algorithm -- and further processing to estimate sea ice cover from these data. "You'd think it would be easy to see which record has this spurious jump in December 1991, but there's so much natural variability in the record -- so much 'noise' from one month to the next -- that it's not readily apparent which record contains the jump. When we subtract one record from the other, though, we remove most of this noise, and the step-like change in December 1991 becomes very clear." "A team of scientists say much of the increase measured for Southern Hemisphere sea ice could be due to a processing error in the satellite data"
" It's also curious that this "significant error" occurred 23 years ago, but was not found until Antarctic sea ice hit all-time record highs, and that they don't know whether the data since 12/91 is erroneous or not. " No it's not. It's what they do. Whenever we use science to weaken their claims, they come up with these (I believe) BS claims. This paper by Eisenman, Meier and Norris does not mean what it seems to mean. What counts is the total amount of land and sea ice. It really does not matter whether the ice is on the land or on the sea. The source of the ice, including most of the sea ice, must be mainly precipitation over the coastal areas of Antarctica. (The interior is a desert). Calving of the glaciers is caused by the increased weight of ice. Antarctic glaciers, save for a geothermal region in the SW, do not melt or slide into the sea. The bases of Antarctic glaciers are locked to the bedrock. Thus the weight of the ice causes shear and glaciers move under gravitational forces like rock strata.. Increased precipitation in the coastal areas has increased the ice mass in the coastal areas. Warmists claim that this is evidence of global warming. However, if the extent of sea ice is less than estimated, this means that the precipitation must be less than estimated and hence the global warming must be less than estimated. In my opinion, neither the increase in land ice nor the increase in sea ice tells us anything about Antarctic temperature that is relevant to the claimed increase. hiatus, or decrease in global temperature. Since the volume of land and sea ice tells us only about precipitation, the relevant question is: what does an increase or decrease in Antarctic precipitation tell us about global climate? And what do we learn if it turns out that the increase in precipitation is not as great as we had estimated? As for those who have bad-mouthed Dr Eisenman and his colleagues, shame on you. Surely there is satellite imagery of the peak ice for 1979 (or 1980), and the current peak ice for 2013/14. Simple to measure the increase and compare it to the "models". How stupid can these guys be. Just look at the physical evidence, and measure it. As one of the most despised of climate-thinkers, an Undecided, what I find most interesting about this article is that it seems the tide might have reached an inflection point; where Climate Alarmist are actually having to defend their assumptions against the work of Climate Ignorists. Skeptics are not "climate ignorists," far from it, skeptics point out the things alarmists have overlooked or ignored. 'The Pause' both is, and is not, real, depending on the situation, and the argument being made. If this was a medical paper with such a data aberration, it would be regarded as interesting, anecdotal almost but the conclusions would not be considered as evidential until clarified and verified. After all lives are at stake. A little bit like "climate science" judgements - where the quality of billions of lives in the near and distant future are at stake. I'm 97.1% certain that they don't know if there IS a problem.